Concerned your pearly white teeth will be obscured by metal braces? Clear braces still show more than you’d like? Afraid you’ll lose an Invisalign retainer or two during treatment? 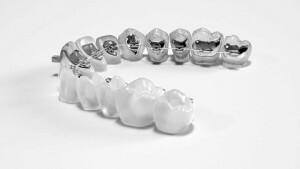 If you answered yes to any of those questions, lingual braces may be the solution. Dr. Cooper is is proud to offer lingual braces. With lingual orthodontics, custom brackets are bonded to the insides of your teeth, so the only thing visible to everyone will be your beautiful smile while all of the work goes on “behind the scenes.” These brackets are custom designed for your teeth, to provide comfortable rapid orthodontic treatment while keeping your smile front and center.